In China, Vietnam and elsewhere, rhino horn is erroneously believed to have medicinal properties, even though it is made from the same material as human fingernails. Sibuya reserve owner Nick Fox said in a statement on the reserve's Facebook page that the suspected poachers entered the reserve late on Sunday night or early on Monday morning. 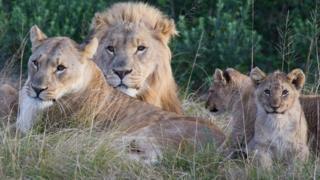 "They strayed into a pride of lions - it's a big pride so they didn't have too much time," Mr Fox told AFP news agency. "We're not sure how many there were - there's not much left of them." An anti-poaching team arrived on the scene, where a hunting rifle with silencer, a long axe and wire-cutters - equipment generally used by rhino poachers - were also found. Four views: How can we save the rhino from poachers?